On December 5, 2017, Executive Office for Immigration Review (EOIR) published a final rule in the Federal Register (FR) titled “Procedures Further Implementing the Annual Limitation on Suspension of Deportation and Cancellation of Removal” (see 82 FR 57336) [PDF version]. The most important aspect of this new final rule is that it authorizes immigration judges and the Board of Immigration Appeals (BIA) to issue final decisions denying applications for cancellation of removal or suspension of deportation regardless of whether the annual limit on grants of cancellation and suspension have been reached. This important change only applies to prospective cases. Additionally, the final rule made a technical change to a regulatory provision regarding certain procedures that were only applicable in 1998. In this article, we will review the new rule and examine its potential effects going forward. On September 30, 1998, the EOIR published an interim rule titled “Suspension of Deportation and Cancellation of Removal” at 63 FR 52134 [PDF version]. The rule concerned procedures for immigration judges and the BIA to follow for implementing the numerical limitation on grants of suspension of deportation and cancellation of removal under the Illegal Immigration Reform and Immigrant Responsibility Act of 1996 (IIRIRA), Public Law 104-208, Div. C, 110 Stat. 3009-546 and the Nicaraguan Adjustment and Central American Relief Act (NACARA), Public Law 105-100, title II, 111 Stat. 2160, 2193-2201. These rules deal with the annual limitation on grants of suspension of deportation and cancellation of removal. Under section 240A(e)(1) of the INA, the Attorney General is limited to 4,000 grants of cancellation of removal and suspension of deportation in any fiscal year. Its most important provision was codified at (the now former) 8 C.F.R. 1240.21(c). Former 8 C.F.R. 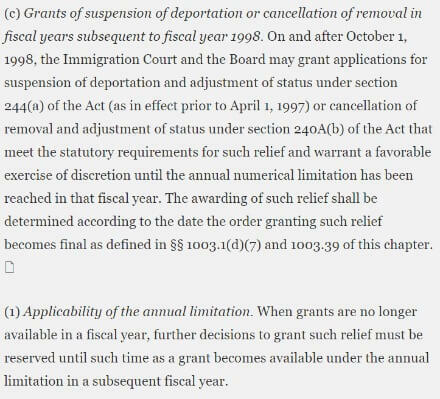 1240.21(c) eliminated a “conditional grant” process for suspension of deportation and cancellation of removal that had been codified in an October 3, 1997 interim rule published at 62 FR 51760 [PDF version]. The conditional grant process had been designed to give the EOIR time to decide how best to manage the annual statutory limitation on grants of suspension of deportation and cancellation of removal. In short, once the limit of grants of suspension of deportation or cancellation of removal had been reached in a fiscal year, an immigration judge or the BIA could only deny an application without reserving it for consideration in the next fiscal year if the applicant did not meet a statutory requirement for relief (e.g., requisite amount of physical presence, lacking good moral character on statutorily enumerated ground). Other cases had to be reserved even if the immigration judge or BIA would have otherwise denied the application. No such restrictions applied if there remained additional grants for the fiscal year. Former 8 C.F.R 1240.21(b) provided for a process to rectify an issue that arose in fiscal year 1998 having to do with the interim rule that had permitted conditional grants of suspension and cancellation and the subsequent enactment of NACARA, which added 4,000 grants, creating a total of 8,000 grants, for fiscal year 1998 only. This one year exception is codified at section 240A(e)(2) of the INA. The new rule removes the language requiring immigration judges and the BIA to, in many cases, reserve until the next fiscal year denials of applications for suspension or cancellation once the annual limit of grants has been reached. Under the new rule, immigration judges and the BIA will only be required to reserve grants of suspension or cancellation once the annual limit has been reached. Immigration judges and the BIA will now be able to issue denials in any case where either finds that the applicant failed to establish that he or she merited relief, including relief on discretionary grounds. In short, immigration judges and the BIA will have the same latitude to issue denials after the annual limit of grants of suspension and cancellation have been reached as they have before the annual limit is reached. However, it is important to note, as the EOIR does at 82 FR 57337, that “[t]he final rule will apply prospectively and will have no effect on decisions that were reserved prior to [the new rule's] effective date.” At 82 FR 57338, the EOIR responded to a comment on this issue by citing to the Supreme Court of the United States decision in Georgetown Univ. Hosp., 488 U.S. 204, 208 (1988) [PDF version], wherein the Court held that “administrative rules will not be construed to have retroactive effect unless their language requires this result.” Accordingly, any cases that have already been reserved will not be affected by the new rule. The DHS struck former 8 C.F.R 1240.21(b) from the regulations. It did so because this regulation was only applicable to 1998 cases. This change will have no effect on any future or pending suspension or cancellation cases. The new rule constitutes a significant change in how applications for suspension of deportation and cancellation of removal will be adjudicated going forward. Specifically, after the annual cap on grants of suspension and cancellation is reached, immigration judges and the BIA will now only reserve cases for consideration in the next fiscal year where relief would otherwise have been granted during the current fiscal year had the cap not been reached. In any case where the immigration judge or BIA determines that relief should not be granted, the application will be denied rather than reserved. An alien in immigration proceedings should always consult with an experienced immigration attorney expeditiously and retain an attorney throughout the process. An experienced attorney will be able to assess the case and determine which avenues the alien may have for relief.